New Zealand’s timeline of fashion history has seen many trends and developments over the years, and the New Zealand Post postie uniforms are no exception. 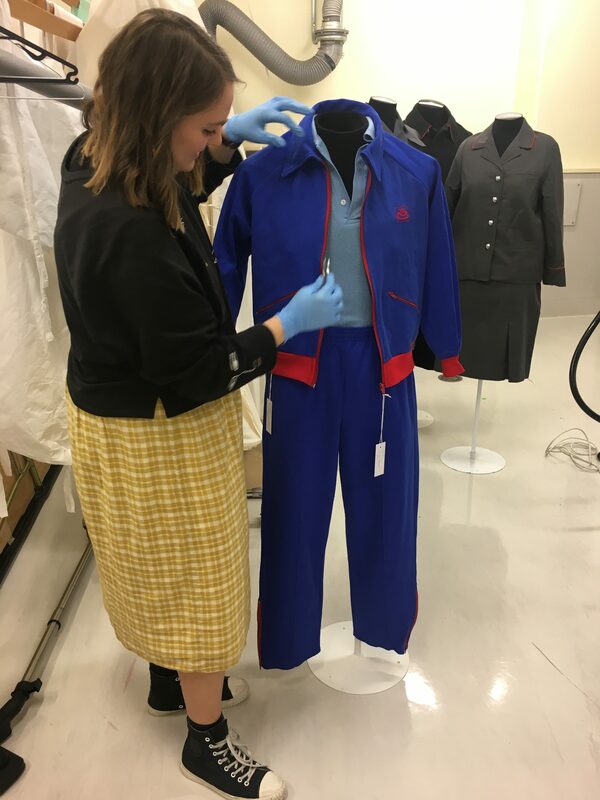 Museum studies intern Ruby Abraham takes us through the postie uniforms in our collection, from military styled suits to vibrant and funky tracksuits that leave little to the imagination! Posties have been working and delivering mail to residents in New Zealand for over 150 years. Fearless when it comes to facing the ferocious weather elements, posties today continue to work hard delivering our mail. Over the past 100 years, postie uniforms have changed to keep up with current fabric technology and contemporary fashion trends. I’ve spent the past few months researching these changing style trends between the 1910s to the 1980s. The earliest uniform set in our collection dates to around the early 1910s and were worn by posties up to the late 1940s. With its thick, dark blue-black woollen overcoat, along with a jacket and trouser set, this uniform is influenced by military uniforms of the late 19th and early 20th centuries. Although seemingly dark and formal, this uniform set has a number of interesting features. For instance extra reinforcements have been added in the groin and shoulder areas to avoid discomfort whilst biking and carrying heavy bags full of mail. Our uniforms from this period also have employee name labels inside the pockets and belonged to a P. O. McGill of Auckland and a M. J. Armstrong of Taupō. Jumping forward to the 1940s, a change of uniform for the postie was proposed after WWII. 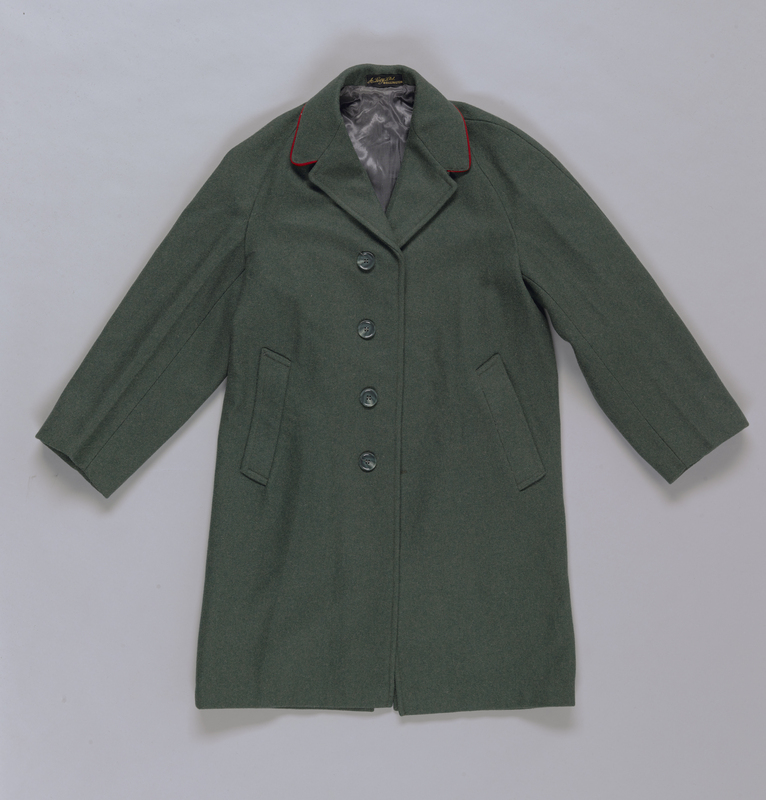 Heavily influenced by military uniforms, the new postie look consisted of a smart green blouson jacket with trousers, along with a new greatcoat. 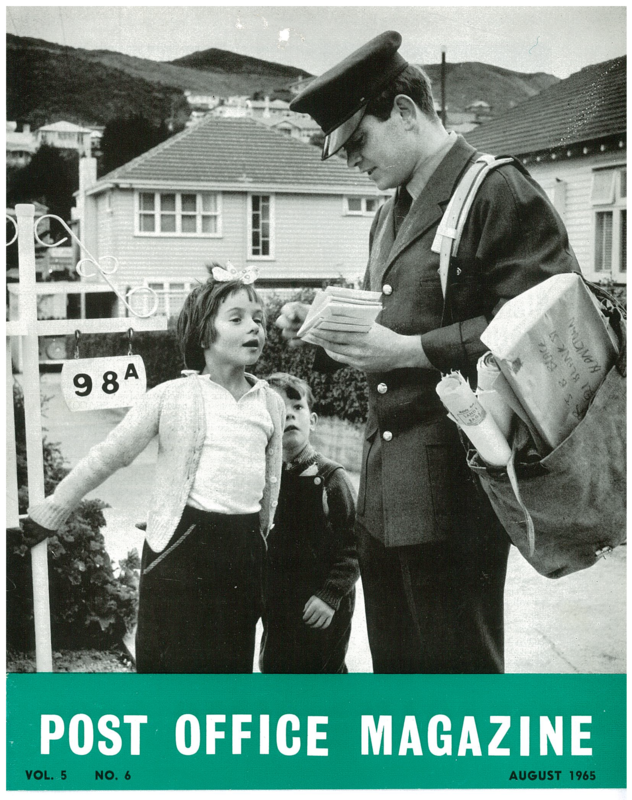 The first postwoman in New Zealand began delivering mail in Wellington in 1942, and was one of many who replaced the men who had been called up for military duties. Although they were paid less and completed shorter mail routes, this marked the beginning of the incorporation of women posties into the Post and Telegraph Department in New Zealand. 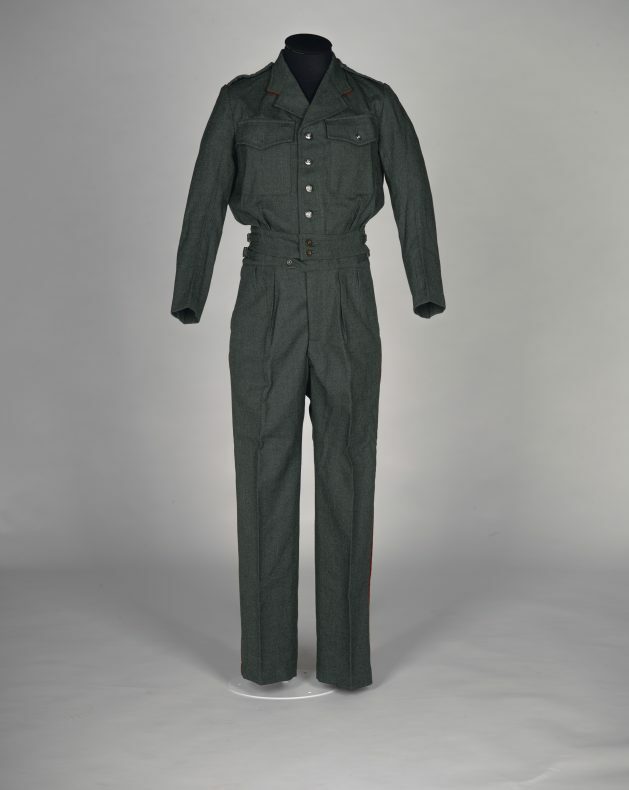 Prior to the introduction of the new grey uniforms in the 1960s, women did not have an official postal uniform which they were required to wear during their rounds. In 1964, the Post Office decided that it was that time again for a new uniform for their posties and telegraph workers. The new look, which was offered in a range of different styles, was grey, and kept a number of traditional elements like the red piping and silver buttons seen in earlier uniforms. Ties were worn by both women and men. Because persons in uniform stand out in a crowd, their uniforms should be as attractive as possible, up to date, and a source of pleasure to the wearer. This new uniform was hugely successful and was worn right through to the 1980s. Comfort and style are definitely two things that can be said about these uniforms. After a corporate design reform in 1975, The New Zealand Post Office introduced a new modernised look which changed the face of the company. The introduction of the new logo, a crown atop a stylised envelope, replaced the traditional crest for New Zealand Post Office. The new sporty and relaxed features of a unisex tracksuit, sneakers and breathable mesh fabrics replaced formal uniform suits and ties, making them more practical for posties on the run. It can definitely be said that New Zealand’s history of mail delivery has been carried out in style. From military fashions to colourful tracksuits, the postie timeline of fashion is one that has seen many developments and transformations over the past 100 years. On the streets today, our posties are seen wearing a sporty red and yellow ensemble – what will be in store next for the postie look? Snazzy! Good read, thanks Ruby. Pretty cool seeing the old pics. Amazing to think they used to effectively have to wear a suit and tie! Excellent to see all your hard work and research come together Ruby. I hope the last uniforms are not the uniform of the day for posties serving in Dunedin in say, July.